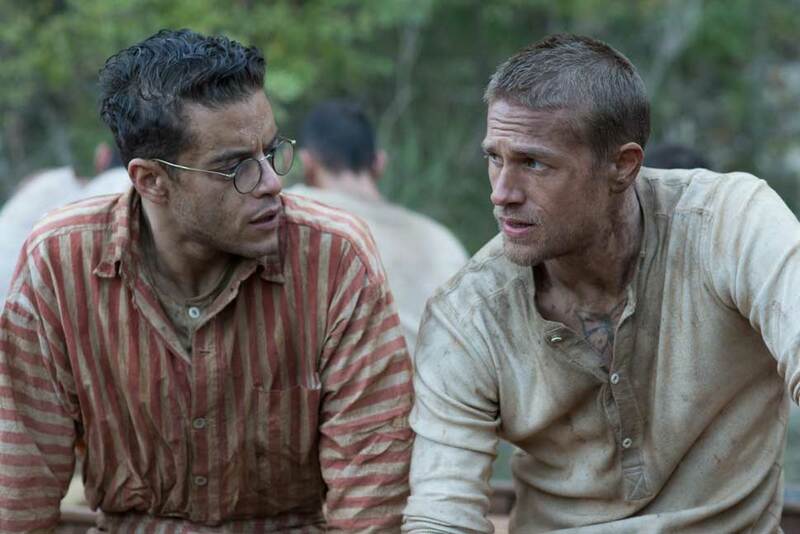 “Papillon,” from director Michael Noer and starring Charlie Hunnam and Rami Malek, is a meticulous and heartfelt ode to the remarkable true life of its title character. It’s also been done before, and for a certain audience comparisons to the previous effort will be inevitable. For those new to the story, there’s a lot to like. However, there’s also much that might have been better with a stronger actor in the lead role. One thing is certain: it’s not an easy movie to watch at times. That’s both a strength and a weakness here — which trait is the more pervasive will depend on the viewer. Hunnam plays real-life French safecracker Henri “Papillon” Charrière, who in 1931 lives the life of a dashing rogue in Paris. He’s good at what he does. He’s respected among his peers, and he’s in love. In other words, he’s ripe for a fall. That fall comes in the form of a frame-job for murder. In short order he’s sentenced to a life term at a penal colony in South America. Of course, “Papi,” as he’s known to friends, has no intention of staying. He sees a means to his escape in a fellow prisoner, Louis Dega, a forger whose diminutive physical stature makes him an easy target among the thousands of violent criminals surrounding them both. The two men make a bargain, an alliance of necessity. Papi keeps the wolves at bay, and in return Dega eventually finances Papi’s escape. But life in the colony present them with challenges neither could have imagined. Between the guards and their rifles, the miles of rainforest surrounding the colony, and the ocean beyond, escape is unlikely. Years of solitary confinement await those who try and fail. Papi and Dega will face them all in turn. The story of their survival is thus the stuff of legend. That alone should make clear the challenge the filmmakers undertake in terms of telling this particular story. The original 1973 film made from Trumbo’s screenplay, which starred Steve McQueen and Dustin Hoffman, was a hit at the time and is still well-regarded. But there’s enough in common between the two that for audiences who remember the earlier film comparisons are going to happen. For those viewers, the new film is likely to come up short. After all, Hunnam is no Steve McQueen — the work he delivers is solid, but unspectacular. Malek fares better. His eccentric take on Dega, as well as his tremendous range of expression, deliver a performance that’s worlds’ apart from Hoffman’s version of the character. The new film is also arguably more viscerally affecting in terms of the brutality depicted on screen. On one hand, that’s a testament to the production’s commitment to telling Charrière’s story in an authentic way. But at two hours and 17 minutes (just five minutes shorter than the earlier film), that’s a lot of privation and suffering to sit through. Some audiences may feel like they’ve been issued a life sentence watching the film. 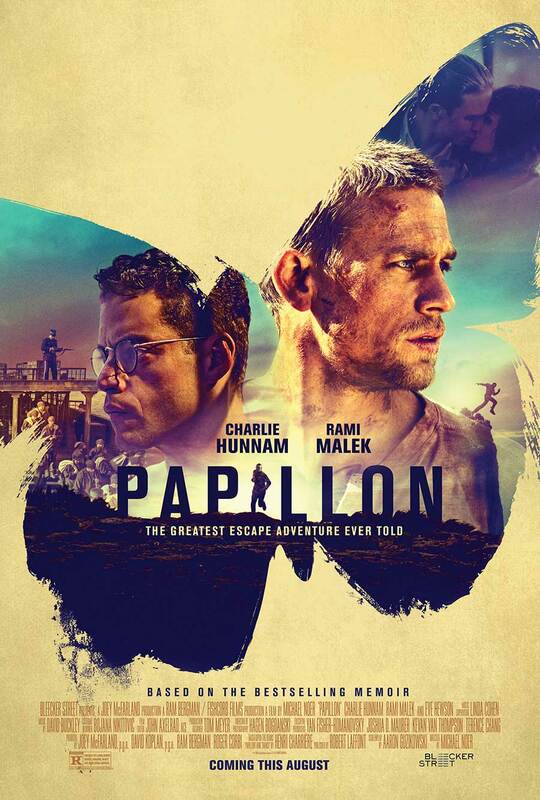 All that said, “Papillon” has just enough going for it that it’s worth recommending. As long as you know what you’re in for, that is. It’s a period film and a prison drama. Those descriptors alone probably should filter out most folks looking for a good time at the movies on a weekend. But if you’re curious to see how these performers take on these characters, and how this production re-tells this amazing story, you should come away with lots to think and talk about. Starring Charlie Hunnam, Rami Malek, Eve Hewson, Roland Møller, Yorick van Wegeningen and Tommy Flanagan. Directed by Michael Noer.